Living with stein collecting maniacs has not made survival any easier. My parents have turned the house into an antique shop from which nothing leaves but as sure as God gave Musterschutz the turnip, he has given this poor house's walls an almost endless supply of steins to bear. 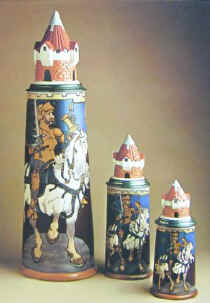 The Knight on a White Horse, designed by H. Schlitt, was produced in three sizes - 5.8 L (#2764), 1.0 and 0.5 L (#2765). Whenever my folks leave on another mission of purchase I sit in the kitchen and stare up at the walls filled with shelf after shelf of old time drinking cups - all different - big and small - dazzling and plain. I try to decide which giant I'm going to fill with the two eight-packs of Budweiser nips I've just bought. Should I steal the huge White Knight from its locked cabinet or maybe just satisfy my fantasy with a full liter guzzled down from the Black Forest? I'm rummaging through the drawer where the key to the cabinets are hidden beneath some old birthday cards; my hands shake as I turn the lock, slide the glass doors open and suddenly my head clears. I squeak the doors shut, look around and hope the dead engravers responsible for these steins had not been watching: they surely would have damaged me beyond the repair capabilities of the Murphy-Fox prestige. Sometimes my folks leave for a weekend. Naturally word spreads amongst my alcoholic friends that the Clarke house has got no adults governing the property; I'm never one to ignore the chance to blast the rock & roll and have a good loud bunch of friends over to raise the roof, but since my house has turned more museum than living quarters, I've become hesitant about who I let enter the door. Of course I had to learn the hard way. Pete was O.K. until beer invaded his mind. Since Mettlach steins were originally designed to hold German beers, Pete would always show up with a six-pack of imported Lowenbrau and insist he have his own stein. It didn't matter which, so I gave him a cheap one like the kind used as a pencil-pen holder for a desk. One night after putting eight full liters in a stomach only filled with popcorn, Pete decided he didn't like the one he had; he wanted one with all the nice drawings of medieval characters etched around its body. 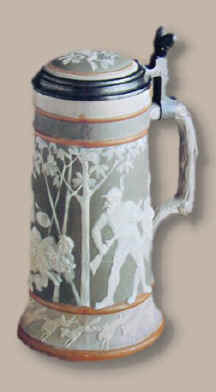 The Boar Hunt cameo stein in 1.0 L size. I wasn't watching Pete or anybody else when suddenly I saw him holding something different. "What's that you got?" My voice cracked with terror!!! He bolted from the room and out the front door like a leopard after something in the bush. I chased him down the street; he ran singing and skipping and chugging long drinks of beer but he didn't have his pencil-pen holding stein anymore - instead he gripped between his slippery beer-wet fingers my father's precious and treasured Boar Hunt! I cornered him against a tree and after five minutes of begging and pleading, almost to the point where I collapsed with both knees on the street, did he return the stein back into my cold sweat-soaked hands. I went back to the house inspecting the stein all the way to make sure nothing had happened and thank God nothing did - I washed and dried the Mettlach, carefully returned it to its proper place on the dining room shelf and have never had another party since. The late Patrick J. Clarke, Sr. was one of the early members of SCI and he served as Treasurer from 1978 to 1988. He was awarded the Jack Heimann Service Award in 1985.